Our Leather Seal Replacement threads direct into the piston head. The thread size is commonly an M5 x 0.8 in most Leather Seal arrangements. 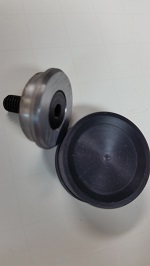 However, if the thread size is different from the one we supply, the OEM screw that is currently in the Leather Seal may be put through the hole of the seal retainer and used. Either way, there is now an option to use synthetic, Moly Core seal to greatly improve shot cycle and velocity performance. 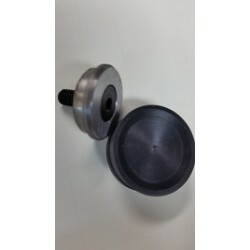 Vortek Vac-Seal 25 adapter, also includes a Vac-Seal 25-Moly-Core piston seal. With this upgrade to VORTEK Vac-Seal 25 synthetic piston seal, you obtain significantly better performance and smoother operation, and significantly more damping against piston slam. Easily installed with a standard Allen key. VORTEK Vac-Seal also prevents spring fracture, which is commonly found on older spring rifles with leather piston seal. Diana 25 and 27 models. Note that long-term use of faulty leather piston seal will result in scratches and dents in the cylinder, which may affect performance. Be sure to remove all sharp edges and scratches before you mount the Vac-Seal conversion in your spring air rifle.